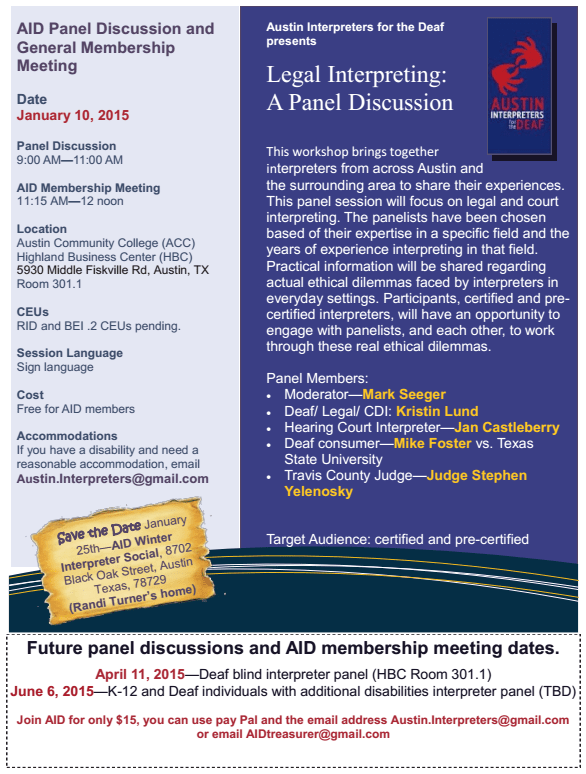 Austin Interpreters for the Deaf (AID) is proud to announce a legal workshop from different perspectives this Saturday, 10 January 2015 from 9:00-11:00am at ACC HBC. This workshop brings together interpreters from across Austin and the surrounding area to share their experiences. This panel session will focus on legal and court interpreting. The panelists have been chosen based of their expertise in a specific field and the years of experience interpreting in that field. Practical information will be shared regarding actual ethical dilemmas faced by interpreters in everyday settings. Participants, certified and precertified interpreters, will have an opportunity to engage with panelists, and each other, to work through these real ethical dilemmas. CEUs: RID and BEI .2 CEUs pending. Future panel discussions and AID membership meeting dates.